You are currently browsing the Fat Cyclist weblog archives for December, 2008. Every year, Kenny puts on a couple of non-official events that are every bit as important to me — and to lots of other people, evidently — as the big-time official events. One of them is RAWROD (Ride Around White Rim in One Day). The other is Kenny’s New Year’s Day Squaw Peak Hill Climb. Obviously, RAWROD’s months away, but the Hill Climb is coming right up. Below is the invitation email Kenny sent around. If you’re in the area, why don’t you come join us? Cost: There is no entry fee because this is a non-official event. There is no waiver because you are responsible for your own well being. For this ride and also for RAWROD, I will be asking everyone to log onto my livestrong page and make a donation for any amount that you can. Where and When: We will be starting at 10:00 at the base of the Squaw Peak Road. We will have an alternate route planned if the road proves unrideable. Who: If you read this, you’re invited. Please forward this email to anyone who might be interested and feel free to post it on your respective blogs. And ask them to make a donation at Kenny’s LiveStrong Page, too. It’s the right thing to do. Post ride Coffee and Hot Chocolate, My Treat!! We will be having Coffee and Hot Chocolate at the “Borders” on University immediately following the ride. Today I need to wrap presents, stuff stockings, buy groceries, and prepare the Christmas dinner. All in addition to my normal caretaking responsibilities: feed the family, clean the house, take care of Susan. Amazingly, I am not even mildly freaked out. I can do this. My new superpower — my most practical one, by a mile — is to take care of my family and manage the house. Today will be easy and fun, with plenty of time left over for watching both Rudolph the Red-Nosed Reindeer and A Christmas Story. OK, that’s not precisely true. I am actually pretty freaked out about the present-wrapping part. See, as a teenager Susan worked at a Hallmark store, where she learned to wrap presents with a precision and perfection that has left more than one person unwilling to unwrap a gift, saying it would be destroying art. I, on the other hand, went to a store last night and bought a whole bunch of those “gift wrap bags,” where you put the present in the bag and then stuff some tissue paper in it above the present to obscure what it is. I assert that this allows us to recycle the gift wrap, and is therefore the environmentally responsible thing to do. Also, I’m much less likely to give myself a nasty paper cut. Oh, and also I do not have any idea where the kids’ stockings are. So there’s some fairly serious garage rummaging in my immediate future. Christmas has always been Susan’s favorite holiday. I’m going to do what I can to make this one really, really good for her. And I hope yours is really, really good too. PS: I’ll resume posting new stuff January 5. I might move some stuff over from my old MSN Spaces archive between now and then, so if you didn’t read my blog when I first started, you can pretend I’m posting new stuff. Although that would be kind of weird of you. PPS: Or I might not do anything at all between now and then. Hard to say, to tell the truth. PPPS: Regardless, have a great new year, too. Ante: Everyone who wants to join has to put some skin in the game by donating a certain amount to my LiveStrong Challenge Fundraising page. I will then reciprocate by donating the same amount to your LiveStrong Challenge Fundraising page. The amount you choose by donating to my page becomes our monthly bet amount. The Monthly Bet: Each month, we state how much we will lose by the end of that month. It has to be an ambitious goal. Loser Pays: If I miss my goal, I donate our bet amount to your page. If you miss your goal, you donate that amount to my page. If we both hit our goals, then we’re both lighter, and that’s pretty cool, too. No Quitting Allowed. If you join the challenge, you’re in until the end of July. No exceptions, no bail-outs. You can quit dieting, but that just means you lose and donate to my account every month. It Exposes Me, Big Time. I don’t do well with bets when I can afford to lose. If I’m betting an average of $20 / month with 100 people, I could wind up losing $2000 per month. I could afford that maybe once, but certainly not more than once. It’s Personal. I’ll be betting something with each individual person. I like that. It’s Simple. A couple years ago when we did the B7 Challenge, I just about lost my mind keeping track of the prizes and rankings. And while I did very well, the effort of collecting all those prizes was just too much and I left dozens of them uncollected. It’s For a Good Cause. No matter how well we all do at this contest, the LAF is going to benefit. And when we fail, at least some good comes of it. Not Humiliating Enough. When you or I fail, it’s just not humiliating. I think I can rectify this by publishing a “Non-Losing Losers” list each month, listing everyone who failed in their goals. It Feels Too Good To Lose. This goes along with the first point. When you lose, it’s easy to think, “Well, that’s OK; I’m just donating to a good cause.” So there needs to be something else you (or I) give up when you miss your objective. It’s this part — the penalty for failure — that I’m hoping you’ll give me some good ideas for. Although I’m definitely happy to have suggestions for other parts too. Like, what should the carrot be (currently, all incentives for this contest are definitely stick-like)? Give me your suggestions, and we’ll nail this down. At the beginning of the year, we’ll start sign-up and get going. The B7 from a couple years ago was a lot of fun, except when it was embarrassing. I’m expecting this will be no different. A Note from Fatty: Tomorrow I’ll be drawing the winner for the Photoshop raffle. Every $5.00 you donate at Bob’s LiveStrong Fundraising page earns you a chance at winning this $700 software (Mac or PC — you decide). Click here to donate now. This morning, I stepped on the scale for the first time in about a month. It confirmed what I suspected, based on the suspicious fact that my fat pants are beginning to feel a little tight. I currently weigh 181.2 (pounds, not kilograms, but the winter is young). Well, here are the techniques I’ve been using. Try them yourself; I think you’ll find them remarkably effective. 1. Prepare Food For Finicky Twins. My twins eat approximately 3 different foods. Cereal, yogurt, and peanut butter and Nutella sandwiches. And the problem is, Susan used to prepare their sandwiches. This may not seem like a problem until you realize that Susan does everything with a little extra motherly love. Which, in this case, means that she cut the crusts off the sandwiches. You still don’t see the problem, do you? Well, the first part of the problem is that I now have to cut the crusts off two sandwiches at least once per day, or I’ll be scolded by two very disappointed little girls. But that’s not the real problem. The real problem is that after cutting the crusts off two peanut butter and Nutella sandwiches, I’m left with…the crusts of two peanut butter and Nutella sandwiches. And — unlike my twins — I have no problem with eating the crusts of sandwiches. Here’s an interesting fact you may want to share with friends at your office holiday party: eating the crusts of two peanut butter and Nutella sandwiches is almost exactly the same as eating a whole peanut butter and Nutella sandwich, calorie-wise. However, somehow — dark magic, I believe — eating those crusts somehow doesn’t feel like you have eaten a sandwich. It’s very easy, in fact, to persuade yourself that you’ve just eaten a couple of bread crusts, as if those crusts weren’t being held together by the Reese’s Peanut Butter Cup of sandwich spreads. 2. Prepare Food For A Light Eater. Susan doesn’t eat much these days. A piece of toast for breakfast, a couple bites of something for lunch, and another couple bites of something else for dinner. The truth is, she mostly lives on Gatorade right now. She likes the “Rain” flavors. On the plus side, that means I get to keep all the Diet Coke to myself. The thing is, though, I can’t help myself: I prepare her meals as if she were going to eat exactly the same amount I am. ‘Cuz, you know, if it turns out that this time she’s hungry, I want her to have as much as she wants. Of course, she never is. And that food’s gotta go somewhere. And — miraculously — I somehow have a little extra room for her leftovers. Because, you know, I wouldn’t want that good food to go to waste. And, if I’m going to be honest with myself, it’s a lot easier to eat the leftovers than to try to find a matching tupperware container and lid. I have a story problem for you. Suppose you have finicky kids and a wife who eats hardly anything. And then further consider having really generous neighbors who want to help — and who know that preparing and delivering meals is an easy way to help. You know what this adds up to? It adds up to a lot of casseroles with an audience of one. And here’s another thing to factor into this equation: I love starchy, cheesy casseroles with rich sauces. I can’t get enough of them. And you know what? They reheat easily, even in the middle of the night, which is when the stress-grazing impulse is strongest. Here’s an amazing fact that will surprise you: If you stop exercising, you’ll lose fitness and gain weight. An interesting corollary to this fact is that if you stop exercising and then don’t re-start for a few weeks, you’ll discover new and exciting reasons not to exercise. Also, you will find that a short-term stall tactic can also work as a long-term stall tactic. For example, for each day during the past three weeks, I have promised myself that I would punch the reset button and start exercising again the following day. And I mean it, too. Each day, I mean it just as much as the previous day. So, since I am now a virtual Clydesdale (there’s a little known rule that for each inch under 6′, your Clydesdale weight is five pounds less than 200 pounds, making my Clydesdale weight 175 lbs), I’d like to rectify the situation. Eat reasonably. I’m going to start eating the right amount, and I’m not going to eat the entire family’s leftovers anymore. Exercise. I just bought seasons 1-5 of The Shield on eBay. I’m going to ride the rollers for two episodes per day. Irresponsible betting. I need an incentive to lose enough weight that I won’t damage the bike frame when Spring rolls around. I figure there are a few others out there who also need similar incentives. And tomorrow, I’m going to roll out the plan. I sometimes wonder if Superman forgets that he has all the superpowers he has: flight, strength, speed, half a dozen kinds of “vision,” freeze breath, heat breath, really really good hearing, invulnerability, and great lung capacity. Seriously, it must be confusing sometimes to know which superpower to use when he’s fighting crime? The X-Ray Vision and flight? Or maybe super speed, heat breath, and just a skosh of super strength? The reason I wonder this about Superman is because I am subject to exactly this malady. I have so many superpowers that I sometimes forget about them. Recently, for example, I have completely forgotten about one of my most obscure — but still exceptionally awesome — powers: the ability to select ridiculously good gifts. But yesterday my gift-discernment superpower (an obscure but well-regarded power) manifested itself in a big way. I thought of two incredibly great gift ideas. And now I’m going to tell you about them, so you can take appropriate action. I spent a big chunk of yesterday afternoon shopping for gifts for my kids. After a couple hours of this, I realized that I had arrived at an important point: I either needed to take a break from shopping or gouge my eyes out. So I went to Home Depot. You know, just to hang out for a few minutes, browse the aisles. For fun. C’mon, you know you do the same thing sometimes. Anyway, as soon as I went in, I saw something I immediately knew every cyclist in the world would want, and that — likely — very few would have. And it was only $8.00, making it an even better gift. Yep, 650 zipties, in 3 different sizes. When combined with a six-pack set of duct tape rolls, you are effectively giving the gift of the ability to fasten anything to anything in a more-or-less permanent fashion. And that’s close to a superpower itself, when you think about it. I know, I know. It’s not exactly the most aesthetically pleasing gift in the history of gifts. But I guarantee it’s one they’ll use. And the first time they need it, they will have a Class 3 Epiphany that you are the best gift-giver they have ever met. The fact that you’re reading this blog entry leads me to conclude that you have access to a computer. And the fact that you have access to a computer makes me suspect that you probably use a digital camera for your photos. And the fact that you have a computer and take digital pictures leads me to suspect that you probably wish you had some really awesome photo editing software. The thing is, though, Photoshop’s expensive. Like $699 expensive, which is very nearly $700 (but not quite, thanks to very clever marketing folks at Adobe). So you probably don’t have it. 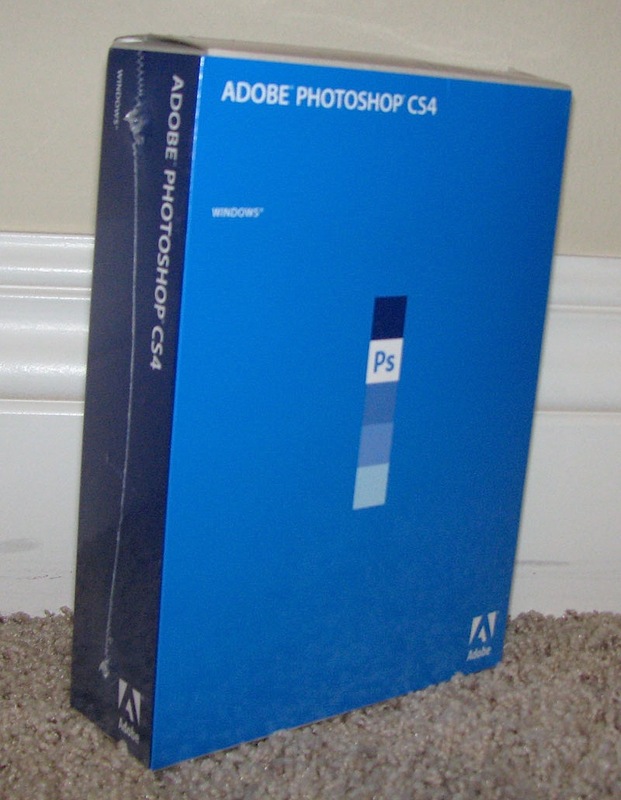 But — starting right now and going through Tuesday — you have a chance to win a brand new copy of Photoshop CS4 (retail box, never opened, your choice of Windows or Mac), while at the same time donating money to the Lance Armstrong Foundation via my friend Bob’s Fundraising Page. Yup, donate $5.00 on Bob’s page and you get a virtual raffle ticket toward the drawing Tuesday. And if you win and want the Windows version, I’ll ship it to you overnight so you get it by Christmas (if you want the Mac version or prefer Photoshop Extended you’ll have to wait a bit longer). The more you donate, the better your chances of winning. So click here and go donate at Bob’s page now. Oh, and also it’s a good chance to do something good — you’re fighting cancer, even as you acquire the means to digitally remove your love handles (which I would never do). And Photoshop would make an awesome Christmas gift. Though I wouldn’t blame you if you kept it for yourself.